Bastardisms: My Gum is Epic. I got a free piece of gum today at the convention that was being held at the building where I work. 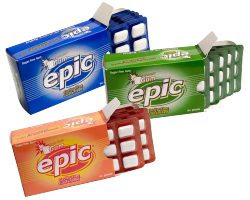 It was Epic brand gum. I told the lady that gave it to me that I would have to read my copy of The Illiad while I chewed it. She then recommended The Odysey. I would have led with saying that I should read my copy of the Aeneid, but I was pretty sure that was too obscure a reference. It wasn't. We went on to banter back and forth as many obscure epic references as we could. I think I won with Gilgamesh and then with Roland.